Is “Growing the Economy” Really the Answer to Wage Stagnation? So, does the old adage remain true that “a rising tide lifts all boats”? To believe this, you have to ignore a lot of data. Exhibit A is the chart that the Economic Policy Institute updates every year, which shows wage growth relative to productivity growth. Since productivity growth is the measure of the economy growing, we would expect wages to rise as productivity goes up if the cure for wage stagnation was in fact a growing economy. But what do we actually see? From the end of World War II through the beginning of the 1970s, the adage largely held true, as wages and productivity grew together. 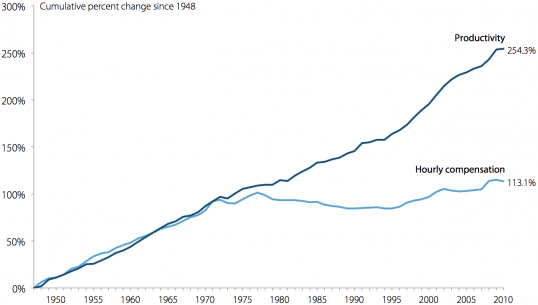 But starting in the 1970s, that changed: wages flattened, while productivity continued to rise. In other words, the economy grew, but wages remained stagnant. A rising tide did not lift all boats. 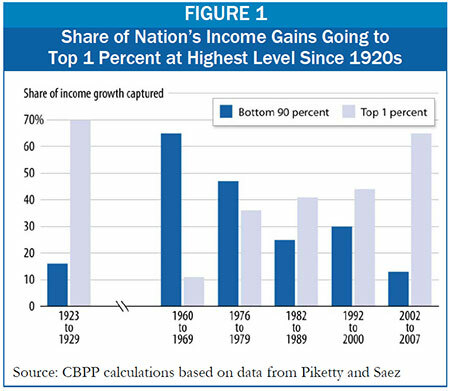 Starting in the 1970s, the share of income gains going to the bottom 90 percent declined, while the share accruing to the top 1 percent grew at an astronomical rate. By the 2000s, even before the crash, over 60 percent of income gains were going straight to the top 1 percent, similar to pre-Depression levels. In 2008, the top 1 percent lost ground, but quickly bounced back. Between 2009 and 2011, they captured 121 percent of income growth. That is, not only did all income growth for that period go to the top 1 percent, but they also nabbed some more from the bottom 99 percent, who lost ground in that period (Source: http://elsa.berkeley.edu/~saez/saez-UStopincomes-2011.pdf, Table 1). In short, if we want to understand what’s behind wage stagnation, we can’t just hope that things get better as the economy recovers. We need to look at the role of politics and movements in shaping wage dynamics. In the postwar period, a strong labor movement fought for living wages that grew as the economy grew. Starting in the 1970s, and accelerating thereafter, unions lost the ability to do that, while those at the very top saw massive income gains. I explore the reasons for this in my own work, which are best left for future posts. What can we do to address wage stagnation now? There are no easy answers, but fast food workers are showing us a possible approach with their “Fight for 15″ campaign. As part of that, workers at fast food restaurants across the country are striking to demand living wages today. It’s too early to tell how successful they will be, but at least they are starting to get to the root of the problem. Because when it comes to addressing wage stagnation, it’s not just a question of “growing the economy.” It’s a question of power. 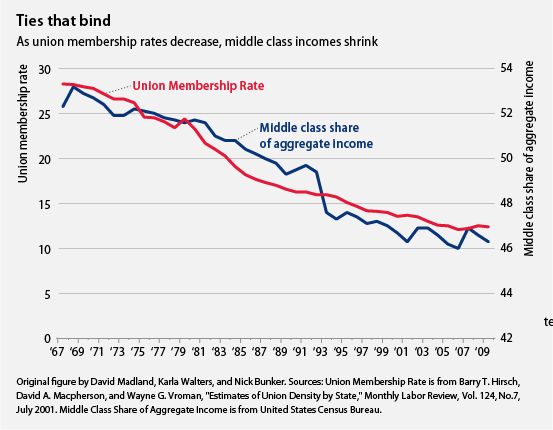 NOTE: I realize that the dual scales on the CAP chart comparing union density and middle class income share decline gives the misleading impression that both declined at virtually the same rate. If you adjust the scales, the slope of income share decline isn’t as steep as for union density. Nonetheless, the point remains that the two did decline in tandem, while the income share of those at the very top exploded in the same time frame.